Formula 1 designer Adrian Newey became the winner of the Segrave Trophy for 2010, for being the only Formula 1 designer to have designed championship-winning cars for three different teams – Williams F1, McLaren and, in 2010, Red Bull Racing. 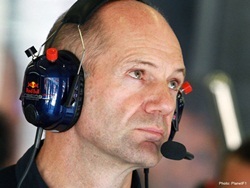 Adrian Newey gained a First Class honours degree in Aeronautics and Astronautics from the University of Southampton and immediately moved into Formula 1 with the Fittipaldi team. A year later, in 1980, he joined March and went on to design the team’s GTP sports cars. A spell working with March in IndyCar followed before he returned to Formula 1 with the new Leyton House team as Technical Director. Although recognized as a talented designer, his skills didn’t translate into results until he joined Williams F1 in 1990. Newey and Patrick Head at Williams F1 became the dominant design partnership winning four Formula One World Constructors’ Championships. More titles followed when Newey moved to McLaren in 1997. In 2006 he joined Red Bull Racing and by 2010 Newey’s latest design (the RB6) was the class of the field, taking 15 pole positions and nine race wins to secure both drivers’ and constructors’ championships. Outside the F1 arena, Newey collects sports cars and has competed in Le Mans Legend races as well as the Goodwood Revival meeting, winning the TT Race in 2009. In 2007, he and his co-drivers finished fourth in class in the 24 Hours of Le Mans. Last year he took part in the Goodwood Festival of Speed in a Red Bull RB5. The Segrave Trophy was created in 1930 to commemorate the life of Sir Henry Segrave who was the first British driver to win a Grand Prix in a British car, at the French Grand Prix at Tours in 1923, the first to hold both the land and water speed records simultaneously and the first person to travel at over 200mph (320km/h) in a land vehicle. On June 13, 1930 he broke the water speed record on Windermere in the Lake District. On the return run his boat capsized after hitting a log. He was rescued and taken unconscious to hospital. He briefly regained consciousness and asked, “Have I broken the record?” He was told of his achievement before dying moments later. Next articleWhat did we learn from the Malaysian Grand Prix?